Over the past few centuries the costume of the Karakalpak male has been fairly similar to that of the other Central Asian groups. Today most men wear Western-style clothing such as a shirt with a collar, belted trousers, and leather shoes or alternatively a t-shirt, track suit bottoms and trainers. For warmth they wear jumpers, jackets and overcoats. Managers and officials normally wear a Western suit and tie, unless they are in uniform. Older men frequently wear some form of headwear. 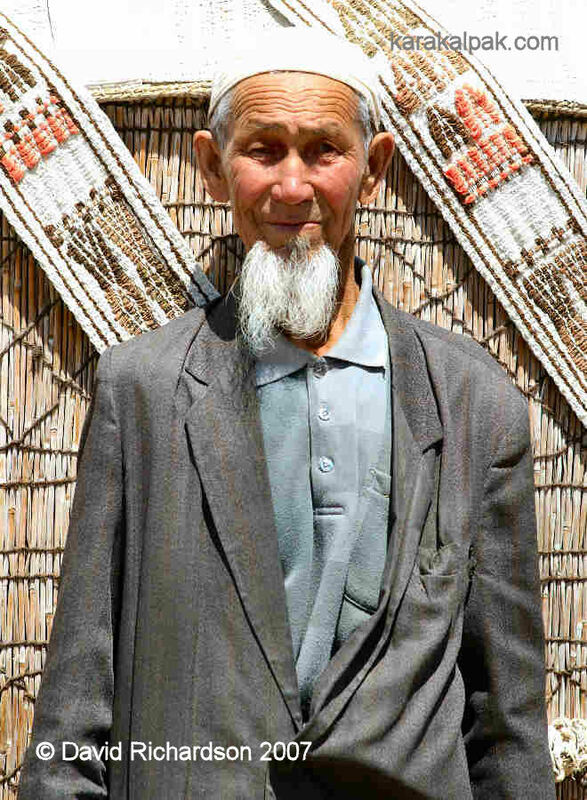 Shapans are still worn by some elderly men in rural areas or for ceremonial occasions. 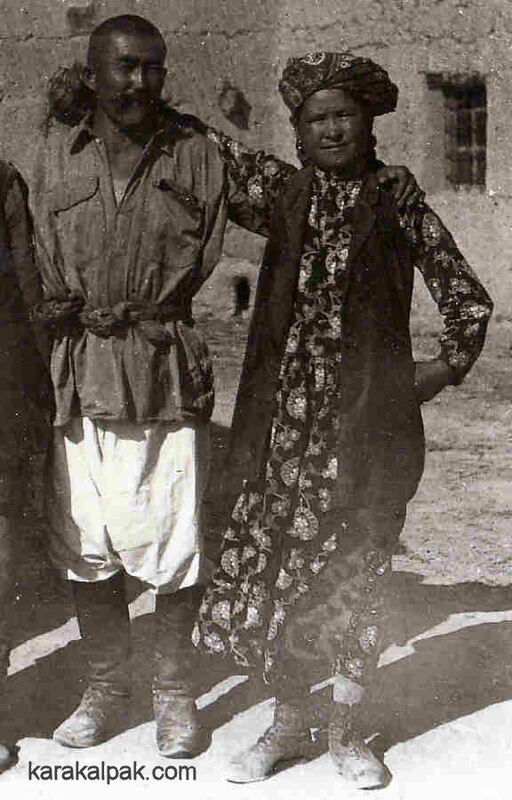 Men at Qon'ırat Bazaar wearing Western-style short-sleeved shirts, trousers, and shoes. 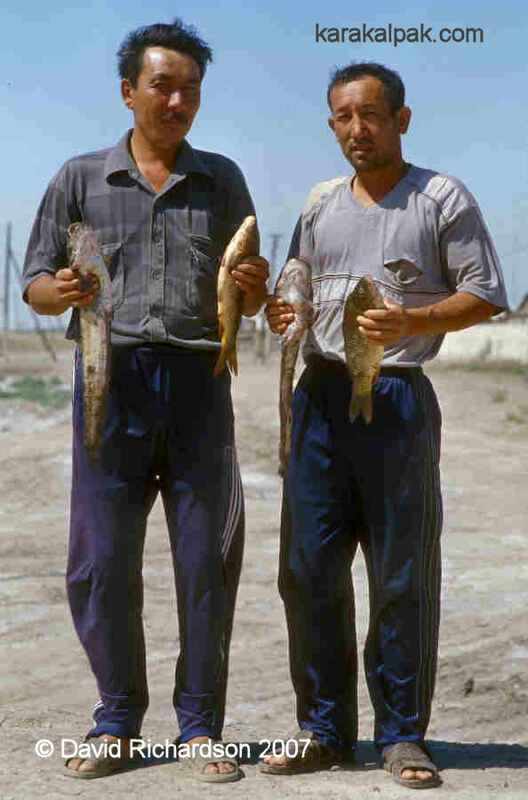 Karakalpak men from the remote village of Qazaqdarya, wearing sports shirts and tracksuit bottoms. Most Karakalpak men are crazy about fishing. A grandfather from Qazaqdarya wearing an old suit jacket and a white skullcap. A proud old gentleman from Bessarı awıl close to Taxta Ko'pir. 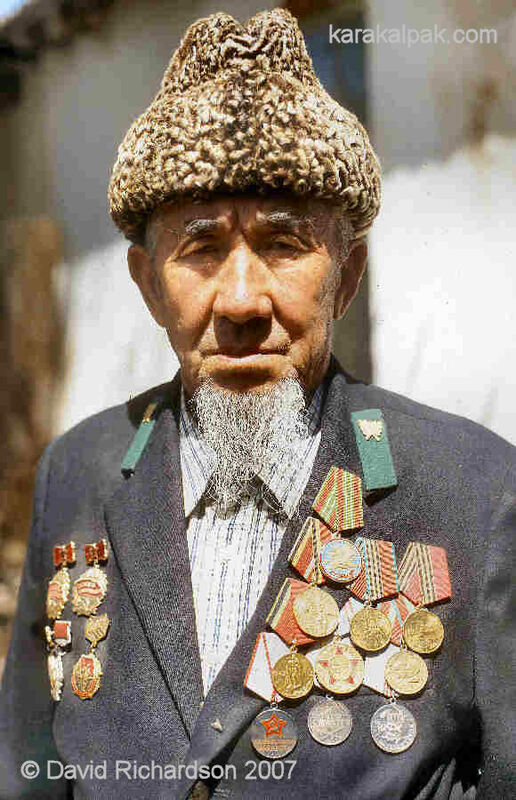 He is wearing an Astrakhan cap or papaq and an old suit jacket bedecked with Soviet medals. 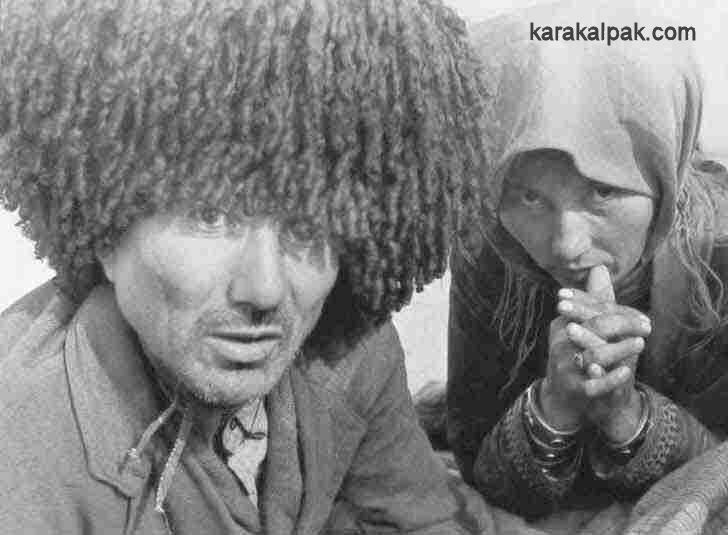 The tinted family photograph of a Karakalpak man from Shomanay, taken around 1980. He is dressed conservatively in a white collarless shirt, a striped shapan, and a black sheepskin cap. The costume of Karakalpak men in the late 19th and the early 20th century was very conservative. Men did not wear brightly coloured clothing. In general, summer clothing was white while winter clothing was dark. In summer men wore a white cotton shirt, or ko'ylek with a horizontal collar opening, which was tied at the waist with a long cloth or kerchief, called a belbew, or a narrow belt known as a qayıs. Ankle-length trousers or ishtan were baggy and tied around the waist with a string. A Karakalpak man in summertime, wearing a baggy Western-style shirt, white baggy trousers, and knee-length boots. His shirt is tied with a belbew. Outside the home a man put on a long or short-sleeved waistcoat-like camisole, usually black, known as a beshpent, or alternatively a shapan tailored from polished alasha. The shapan was tied by another belbew waist cloth. For festive occasions belts were made from silk kerchiefs - either a red tu'rme or a yellow, green, and purple checked ma'deli. Wide leather belts decorated with metal buckles and called ka'ma'r were the preserve of the Karakalpak elite. A young Karakalpak man wearing a collarless shirt, Western jacket tied with a belbew, and a shapan. Photographed by Aleksandr Lavrentyevich Melkov in 1928. 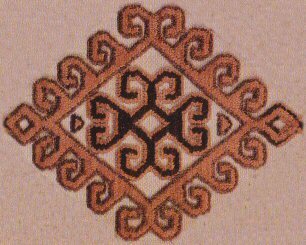 Image courtesy of the Institute of Archaeology, History and Ethnography of the Karakalpak Branch of the Uzbek Academy of Sciences, No'kis. In winter Karakalpak men wore warmer clothes, such as ko'mpey (quilted camisoles). Over their ishtan they wore sım or shalbar - trousers of leather or heavier cotton which may have been quilted. Coats ranged in thickness from the unlined camel wool shekpen, to fur-lined ishik tons, to the enormously heavy postın made from sheepskin pelts and worn with the woollen fleece on the inside. 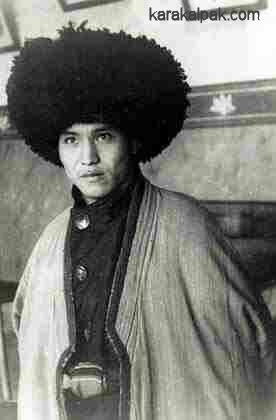 A Karakalpak man wearing a camel wool shekpen and a black qurash cap. In the summer, Karakalpak men wore leather galoshes (gewish) on their bare feet and leather knee-length boots (etik) for going outside the home. In the winter the boots were worn over felt stockings, known as baypaq. Headwear was always worn by adult males. For working in the fields this might be nothing more than a turban-like oramal made from a twisted kerchief. Otherwise they either wore a soft round taqıya or skullcap, or a black or occasionally brown qurash, sometimes called a sho'girme, a large sheepskin cap in the shape of a truncated cone, the widest part being uppermost. Such fur caps were worn around the home and even in the summertime. Contrary to popular belief, Karakalpak men did not generally wear a black qalpaq. 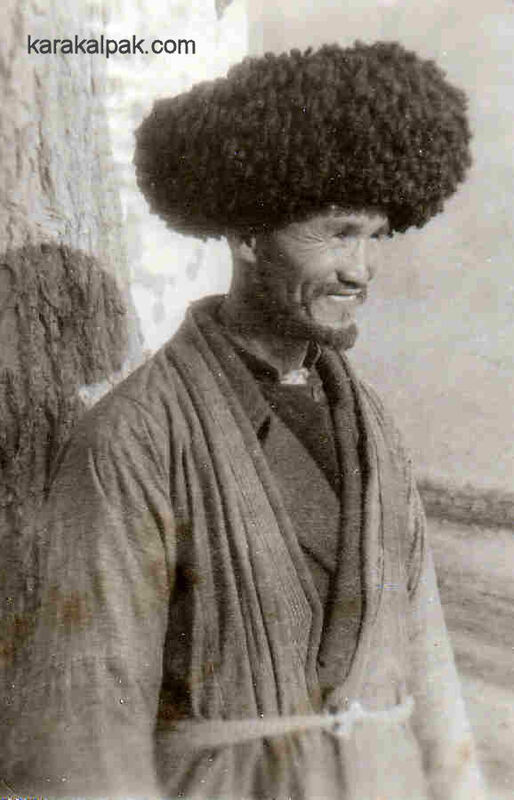 Qalpaq caps were only worn by a few Karakalpaks and Qazaqs living in the central part of the delta during the early part of the 20th century. 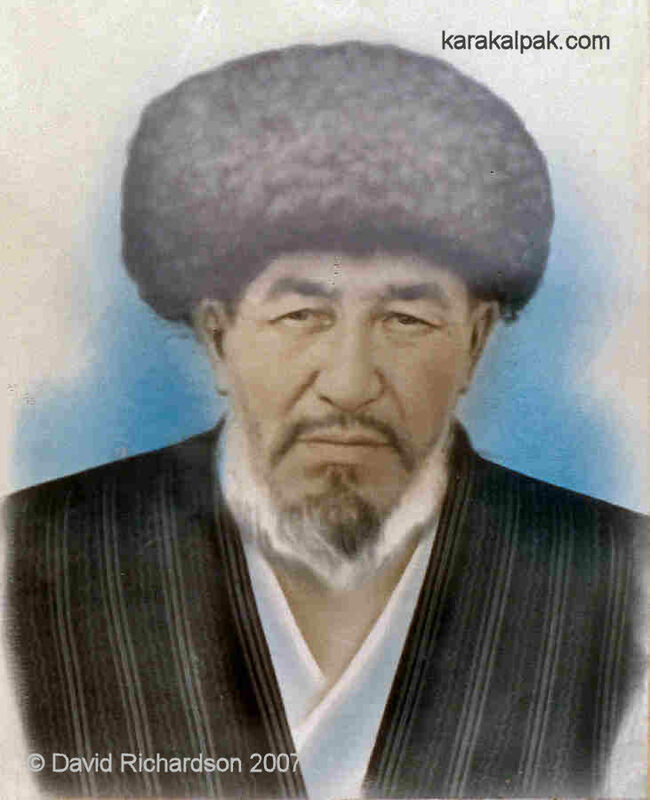 These were black quilted skullcaps with a pointed top, somewhat similar to the traditional white felt qalpaq of the southern Kyrgyz. 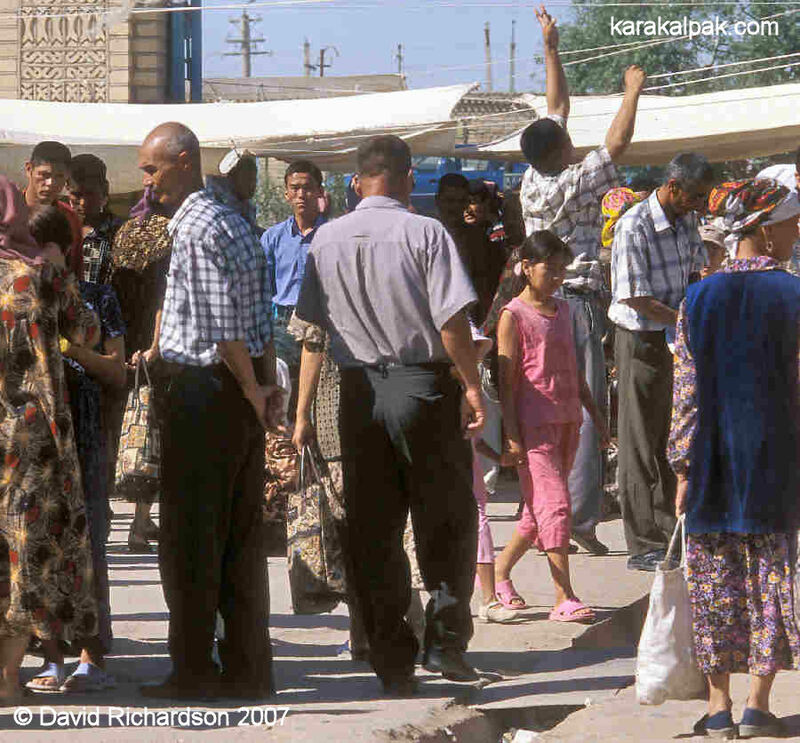 After the creation of the Khorezmian Soviet Socialist Republic in 1923, the Karakalpaks began to come under steadily increasing Russian influence. Even so the Amu Darya delta remained a remote backwater of the Soviet Union, even after the formation of the Karakalpak Autonomous Oblast in 1925. It was not until Karakalpakia was transferred from the Qazaq ASSR to the Russian Federation in 1930 that Russian technicians began flooding into the region. The 1930s became a decade of major change. Karakalpaks did not abandon thier traditions overnight. Men gradually adopted individual items of Western clothing, such as jackets or overcoats, while still retaining the rest of their traditional clothing. World War II was the watershed, after which items of Russian clothing tended to dominate Karakalpak male costume. 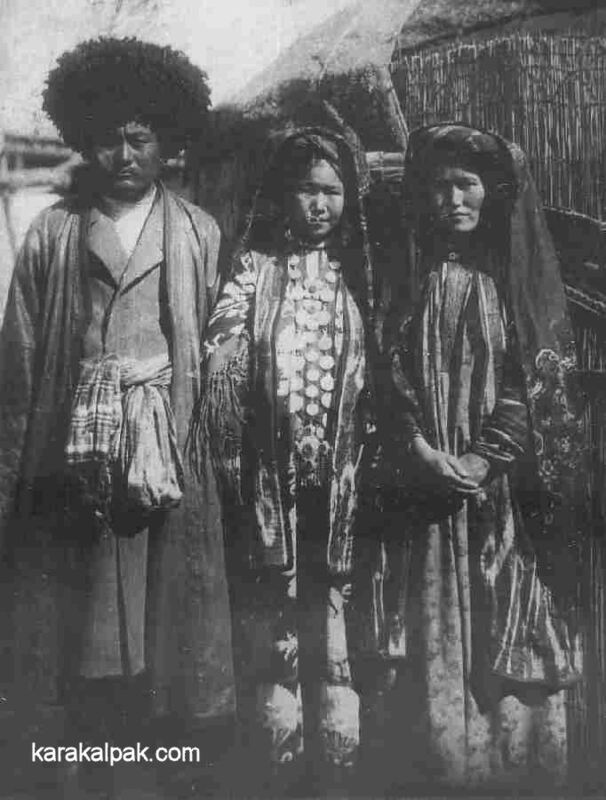 The following photographs show Karakalpaks during this transition period, wearing some traditional items and some imported items. A Karakalpak man wearing a huge sheepskin cap and a Western-style shirt and jacket or coat. A Karakalpak man wearing a Western overcoat tied with a silk ma'deli, with his shapan over the top. 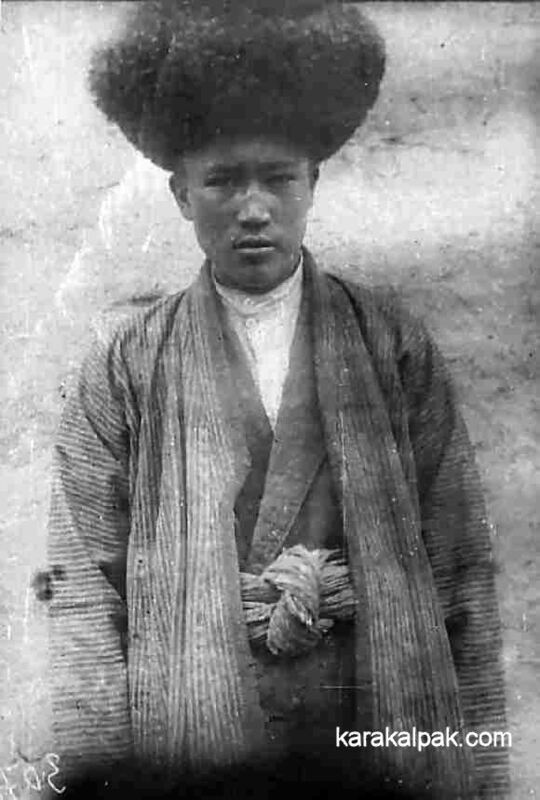 Karakalpak man wearing a shirt and Western-style jacket underneath an alasha shapan tied with string. Image courtesy of the State Museum of Art named after Savitsky, No'kis. Probably photographed in the 1930s. This page was first published in 2006. It was last updated on 5 February 2012.